After reading the article on Apple Classroom of Tomorrow (ACOT) made me wish I was around as a teacher when this program first started. Apple was ahead in its time when they wanted to integrate technology into the classroom and leading the next generation into the 21st century. I don't know if ACOT still exists today, but there are other forms of education teaching teachers how to integrate technology with purpose into the classroom, such as Google Apps for Education (GAFE). I have attended multiple sessions training teachers how to integrate technology in the classroom over the years and I have always felt inspired to bring back and use new technology into my classroom and to my school site. To be honest, after reading articles about ACOT and TPACK, my feeling of excitement turned a bit into stress when I realized, even though I use technology almost every day in my classroom, I am nowhere near where I should be in integrating technology in my lessons at first. Comparing what I am doing the classroom to the SAMR model of technology in education, I would be mostly in the "enhancement" area. Now, due to this Capstone project I am striving to be more in the "transformation" area of technology in the classroom. 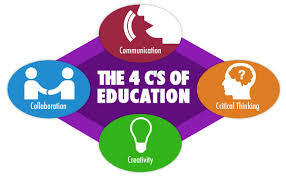 Using the models above and creating more lesson plans that promote the 4 C's of critical thinking, communication, collaboration, and creativity, can prepare our students for the 21st century.